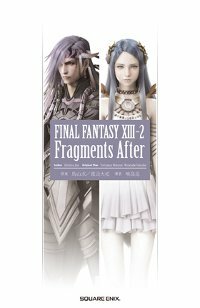 Fragments After is a collection of short stories set in the world of Final Fantasy XIII and XIII-2. It's set during FF13-2, and was written by Jun Eishima. It was released on June 21st, 2012, and its ISBN is 978-4-7575-3650-0. She is a Yeul who loves words and travel. People around the world taught her different words when she was traveling. She learned the words for mountains and flowers and plants, the names of all kinds of things. When she was young her family did not speak a word to her. She grew up her earliest years never hearing human voices. It was to hasten her awakening, she later knew. And one day she heard it from somewhere. A voice, and a word. She tried saying that word to the woman who always took care of her. 'Mother'. She cried in grief, and soon a man came to take her away. That man was her guardian. Her first vision was of a woman being swallowed into darkness. She worried for that woman. In later visions, she saw her fighting with a man. Even later on, she saw that the man she was fighting, this mother-like figure she had grown attached to, was her guardian, her Caius Ballad. Yeul wished the woman well. Yeul wanted to travel and to keep watch for the visions of the mother-like figure and the other girl she kept seeing. She travelled all over, looking for the gates the girl appeared around in her visions. Lightning was walking in the darkness. There was a shore with a strange light, and in the distance there was something that looked like a ruined city. Elsewhere there was darkness, and she was searching for a way out, or to human habitation, or to anyone who could tell her where she was. She tried to avoid the thought that she might be dead and continued walking. Eventually she came to the conclusion that the shoreline wasn't where she was supposed to be, it wasn't where she would find what she was looking for. She headed inland. Soon, a black mist enveloped her. She lost sight of the shore. And then, she came across something shiny. It looked like a toy moogle, but then it spoke. It was wounded. Lightning tried to care for it, but it stubbornly challenged her into a fight. She eventually gave up and punched it a little bit. The moogle was defeated, but was overjoyed to hear that it could follow her even though it was so weak. It told her that this place was Valhalla, and everyone who met had to fight. It also told her that it had drifted here through a spacetime tunnel, and didn't know where to find an entrance to it. Finally, it told her that if she wanted out, her best bet was to go to the goddess in her temple. Lightning started heading towards what she had thought was a ruined city, it was the temple of the goddess. Then the moogle said that there was something strong ahead, too close to avoid. It was Odin, clothed darker than the Odin Lightning knew. He didn't know her. When they exchanged blows, Lightning found out why, and why you had to fight everyone you met. When true blows were exchanged, information was exchanged as well. Lightning now knew that this was a different Odin from hers, one that the goddess had sent to a l'Cie who couldn't win against him. Now it was here. Odin also knew something now, that she had once been a l'Cie. And he was strong, so strong that Lightning soon found herself in a situation where nothing but her powers as a l'Cie could have saved her. She knew she was no longer one, yet she called upon those powers anyway. And they responded. She won over Odin, and he confirmed that the goddess would know how to get out. He changed into his horse form and they rode together towards the goddess's temple. On the way, in the darkness, Lightning encountered something. First it was a presence, then she could see a ripple on the surface of the black mist. It was herself, riding a white Odin. The other her could not see her, but they could both hear each other. The other her told her to go to the temple, that all would be explained there. Lightning realized that the other her had remembered to say that to her, and that the other one must be from the future. Looked like everything impossible was possible here. Together with Odin and the moogle they reached the goddess's temple. Odin said that he couldn't follow further, and the moogle stayed with him. Lightning continued, and was once again enveloped in darkness. Soon, a shining white beast rose from it. It was a Bahamut - not Fang's, this one guarded the temple and the goddess. Lightning and Bahamut fought. She thought she could make it with her rediscovered l'Cie powers, but then the Bahamut took flight and started bombarding her with energy from above. There was nothing she could do. Even her sword flew away from her from the force of an impact. She was just about to run when the moogle came. It said that its pompom said she was in trouble, and it must always help her. It turned into a bow. Lightning took it, and with one arrow that turned into many, she defeated Bahamut. She was now in the throne room of the goddess. Nobody was on the throne as far as she could see, but she could feel the presence of the goddess. She approached the throne alone. The goddess's presence enveloped her. She could see how the goddess Etro had come to be there, and how Etro could not understand like a human did. Etro had given powers to the first little thing, a human girl, whose soul had arrived in Valhalla. That soul hadn't sunk into the darkness like the other souls, and she had sent it to be born aqain and again back to the world where the rest of the humans lived. Etro did not see that she caused suffering for the girl with this action, she had only love and gentleness. She also gave powers to a man who protected the girl seeress, as she came to be known after a while, for she was constantly surrounded by war and strife and needed a companion. Lightningn also saw herself, and how she had sinned gravely against the goddess by taking arms against another human being - she had been forced, but it was still a sin, the goddess grieved for the fallen no matter who they were. And she saw how the goddess granted the wish of herself and the other l'Cie by taking away their brands, even though they had sinned. Then Lightning saw that the goddess was now fading away and that she had a wish that she could not fulfill herself, and that a time of destruction for the world was coming. Lightning decided then and there that she could not leave the goddess. When she regained her senses, she was wearing shining armor. A man was standing nearby. He tried to tell her to not be there for the goddess, that the time of destruction would not be for hundreds of years yet, that she would never be able to go back to her family and friends if she stayed. But Lightning refused to go. She would stay for the goddess. She would help fend off the destruction. The man, a mere illusion, faded. Lightning stayed. This Yeul's first vision had been of flowers in the sky. At first she had thought them pretty, but then dread had filled her. She later asked her guardian about those flowers. He told her that they were evidence of destruction. In later visions, she saw a girl, and then a dark-haired boy. She could see that the boy was of the same tribe as her, but the girl was clearly not. Yet they traveled together. She saw them many times, and always close to the gates, when nobody else she saw even twice. Then she saw a vision with them coming out of a gate, and realized that the two were traveling through time. Her guardian said that they were doing something unforgivable, and Yeul wished it weren't so. She was fond of the dark-haired boy. She wondered if they were good flowers of the earth, or bad flowers of the sky. Her guardian told her how another Yeul had gone on a journey to see the gates, and how their interference had cut her life short. Once, Yeul and Caius went to Oerba. To her surprise, they met the boy and the girl there. The boy knew Caius, and when he saw her he called out her name. He also knew another Yeul, she then knew. She wished she could be the Yeul the boy missed, but could only answer to him that she was not the one he knew. She regretted having to do it when she could see how it hurt him. Snow has just met Rygdea in Palumpolum. He's now on an airship, one that starting to be surrounded by mist and monsters. He has fal'Cie Cactuar with him, he had to snuggle it on board since they don't really allow monsters in. The monsters start attacking the airship, and when it looks like the airship can't make it safely to its destination, Snow comes up with a plan. He takes an airbike from the airship's cargo, and lures away the monsters with Cactuar's help. He succeeds in luring the monsters, and realizes that they are above what was once Bodhum. It is where Eden fell, and these monsters are from within the Ark in Eden, escaped from their hold when the Cocoon fal'Cie went to sleep. In escaping the monsters, he is surrounded by the mist, and when it clears he notices he's right next to the Ark. Suddenly he feels himself floating off the airbike, and then falling. When he recovers from the fall, he finds himself in a big place that looks like the inner parts of a big machine. It looks like a tunnel. Then a black mist or smoke envelops Snow. He's confused, but realizes that it's not hostile. Soon after, there's a bright light and Snow ends up in another big place, the inside of a huge dome or the like. Cactuar has remembered his Focus and regained his powers. When he tries to make Snow a l'Cie, Snow refuses, saying that he's supposed to make Serah happy. Cactuar agrees. The black mist then starts leading Snow deeper in, and soon they come across a human shaped apparition who calls itself the Arbiter of Time. It tells Snow that he's not ready for this place yet, and to come back later. He and Cactur are drawn away from the Arbiter and the black mist, floating. Snow then ends up in a loop, an unreal state where can see and hear the world around him but the world cannot see or hear him, and every time he tries to move he ends up in a different place. He soon realizes that these places are not only different in location but also in time, and finds out that Serah has left Neo Bodhum, finds out that Serah has been saving people, and finally even sees her from a distance. After many locations, he finds himself beneath Cocoon with a battle up in the skies that he can hear but not see. When he does see something, it is Serah, falling lifelessly on the ground. He cannot believe what he sees and takes yet another step as Cocoon falls around him. His final destination is what is left of Neo Bodhum, but completely destroyed. Cocoon is nowhere to be seen. He despairs. If he doesn't have power, he cannot help Serah stay alive. He asks Cactuar to make him l'Cie. Cactuar gives him a Focus to find Serah and fight by her side at that fated battle. That is where Snow's loop ends. He is back by the Ark that used to be in Eden. Beside him is a shining gate. After some deliberation he steps through with Cactuar and ends up in Sunleth. There, he makes for the night. In his dreams, Lightning talks to him. She tells him that he had been stuck in an incomplete gate and that was the weird time-space behavior he witnessed, and when he got out the gate completed itself and could be traveled - now that he had seen different times. She also tells him that flan are gathering at Sunleth, eating away at the crystal pillar supporting Cocoon in the skies. She asks him to protect the pillar to help Serah, and he agrees. Hundreds of years later. Cactuar disappeared somewhere long ago after an attack by the flan. He has defeated the (king pudding) with Serah. The black mist appears again. It brings him to the Coliseum, where the Arbiter of Time awaits. There, he is to fight against many different opponents. This Yule liked to sing. Her first vision had been of a singing crystal, and a dark-haired someone in front of it. He couldn't hear the singing. Caius explained to her that people couldn't hear the crystal singing. The boy in front of the crystal was sad, and Yule wanted to sing to him to comfort him. But he was also very strong, a strength that could get him through anything. Throughout her life, that boy from the first vision comforted Yule. Whenever she had a tough time, she would remember him and aspire to be as strong as him. While she never heard speech in her childhood, her mother sung to her. Because of this, Yule thought, she was blessed, and hadn't awakened until she was 7 years old. It was the longest time for an Oracle. One day, she saw in her vision a day of rain and pained cries and her own death. She thought of the boy and so could bear with the knowledge. She also remembered that he was a traveler of time and changed history. She wanted to believe that what he sought for could be, she didn't want to think badly of him. Thinking so, she decided to go to that city, to that night of pained cries and no song, for it was the end of this journey that she had chosen for herself. Alyssa thinks of recurring dreams. Hers is a one that she feels happened for real. She thought to investigate the conditions of the dream in an effort to stop it with enough knowledge. She had started seeing it 13 years ago, when she became a survivor of the Purge. There is something going on in the Tower of Augusta, an intruder is in the system. Hope and Alyssa chose to go investigate it. Serah and Noel had left Academia not too long ago via a gate, and before then had been the Demi Fal'Cie Adam incident. Hope had a bad feeling about this intruder, closing out one possible suspect after another. The tower was filled with duplicates, no real people were visiting or working right now. They were about to inspect a room close to the elevator when it happened. There was gunfire. Alyssa screamed, and Hope could not find his way to her. He found a trail of blood on the ground, and started following it. Alyssa thinks of how she doesn't want to die, and how it is only a natural thought. Hope remembers how Alyssa had questioned him about his feelings during the Purge. He wonders how she took this long to ask him about it if it had been bothering her like she said. He thinks it weird. He has followed the blood trail to the 51st floor where it ends. He tries the system access panels. Some features seem to be completely gone. He can't contact the outside. He tries tracing the source of the disturbances within the system and finds a simple data file. It is a file of his own findings in AF2 and after. It mentions paradoxes, gates, his and Alyssa's research on the changes in the Paddra ruins, the book of prophecies, meeting a Serah F. and a Noel K. at Paddra…Hope wonders about this. Nowhere in the Academia system are Serah and Noel referred to by name. He then realizes that the intruder's goal wasn't just to show him that they know everything about him, and ducks just in time to avoid a gun shot. It's a replica of a scientist he once worked with, and he disposes of it. Alyssa has always lied and been good at it. She thinks it's for the best to lie, it can bring joy and laughter to other people. A once roommate of hers, Elida, she had thought lying to be always bad. Alyssa disagrees with her. Lying had always been a good way forward to Alyssa, who traveled all the corners of Cocoon with his father whose job took him to all kinds of places. She would construct new past lives and entertain, be somebody in this new crowd. She had had a friend, Neena, who had been just as good at lying as she herself. Together they were able to lie just about anything they wanted to. And it was Neena who she had been visiting in Bodhum when she got involved in the Purge. Hope finds out that now all the system access panels on the 51st floor have been destroyed. He has to go up. On the 52nd floor he finds the panels intact. He is just about to use one when he hears a pained cry. It's Alyssa. He goes towards the voice. It turns out to be a replica of Alyssa who tries to kill him. He disposes of it, and finds all the panels unusable. This time, he can't even choose which floor the elevator goes up to. He steps on it, and a possibility of the intruder's identity forms in his mind. Alyssa thinks how it had been a long time until she found out why the Purge had happened. It was because Pulse l'Cie had been in Bodhum. It was all their fault. On the floor the elevator stops at, there is only one room Hope can access. He realizes that on the access panel is something the intruder wanted him to see. It is a diary, written by Alyssa Zeidell. It starts at AF5, when she goes to work at the Bresha ruins. How she tried to find the grave, but the way to it had disappeared, and how Atlas appeared, how Serah and Noel came and solved everything. How the name on the grave wasn't Alyssa Zeidell but Neena Stein. How it hadn't made her feel any better or more certain she was alive. How he goes to work with Hope Estheim, a famous person and one-time classmate of Elida's. How each of Hope's findings comes to mean bad things to her - how she is alive only because of a paradox, how each of his findings brings him and Serah and Noel closer to solving all the paradoxes and killing her. How none of her research would be remembered as hers, that there would be someone else who would make her discoveries. How she would be forgotten, her life having meant nothing. She starts trying to find a way to stay alive even if all the paradoxes are solved, and throughout all those long years finds nothing. She despairs, then hears of a Caius Ballad, guardian of the Seeress. She thinks that if it wasn't a hereditary title, then that person must know of a way for her to survive. She tries to find him, to no effect. Then the time capsule is built, and she decides to join Hope in his one-way trip to the future. While she is dreaming away the centuries, she meets Caius. She pleads and begs, and finally he gives her an artifact, a false one. He tells her that giving it to Serah would close a door for them. She has come to hate Serah and Noel who work so hard to kill her. She has them find all the Graviton cores to build a new Cocoon, and then gives them the false artifact. She also knows that Hope is working against Caius. She is now determined to help Caius. She makes a plan involving the Agusta Tower. That is the final entry Hope finds. It stops mid-sentence. He now understands what she's been through. He yells at the walls, telling Alyssa that he can help her find a way to live. Finally Alyssa comes to him in person, with a gun that she presses at his back. She tells him that he cannot find a way, and in any case she has found her own way to live, by killing him and getting rid of Serah and Noel. The latter she has already done, the former she is doing now. She pushes the trigger. At that same instant, she starts fading. If Hope cannot live, then he won't find a way for her to survive solving the paradoxes, and she disappears. She realizes this as she fades. Hope yet lives, if Alyssa doesn't exist she cannot shoot him. With the last of her existence, she begs for him not to forget her. Hope is making one last round of the old Cocoon. It is about to fall. All the people have moved to the new Cocoon long ago. He has completed everything else, and now finds himself in the ruins of Bresha. He doesn't know what draws him here, yet something does. An intern, Aina Stein, comes searching for him. She sees that he is standing in front of some sort of a grave. He says he doesn't know why, and the two leave. Hope feels that there is something he should remember, but he can't remember it. The two leave for the new Cocoon. This Yeul never told his caretaker what her first vision was. There were also many other visions she never told him. She didn't trust him, or any other person. They were only people. She hated people and wanted that they would all die. She had been an unwanted child, born to a mother who didn't care about her. She knew that her mother would also likely die when Cocoon would fall. Most people in the world would. She traveled the world with her caretaker, seeing wars and smelling the stink everywhere. Yet she had a freedom of kinds, wherever she felt like going her caretaker would take her to. Yet she didn't tell him everything. The words of a Seeress were powerful enough to change time. She was scared. What she had seen in her first vision had been the end of the world. A boy alone, having lost everything. She wished that everyone would die so that nobody would be left alone. After that first vision she saw him together with someone, yet she knew that eventually he would be alone. She couldn't wish ill for him, she wished for him to become happy. She made a wish to her caretaker. Let the last Seeress live a normal life, she said. Let her have happiness. He agreed. In her heart, she felt that maybe she could trust this Caius Ballad just a little bit. She had never wanted to see anything. She knew the two had to be stopped. She knew that if they did what they wanted to it would end in death and suffering only, in eternal darkness. She begged for help. She begged not to be left alone. She asked if she could trust them. She didn't want to see anymore, no more death and no more suffering, no more the end of the world.